HappyMommy HappyRachael: Julia Child tried to kill me today! I attempted another recipe today, French Bread Rolls. I realized, I do not know how to cook. I mean, I do cook and sometimes I do it very well. I love this baking book and have created amazing bread, deserts and savory baked items. I just knew I could master the art of baking like Julia. Well, it took all day. I rose, I deflated, I rose and then kneaded and then rolled and then rose again. I baked and then I was done. In between all of this, I worked, took care of my youngest, worked a little more, greeted my oldest when Opa brought her home from her adventure day with the grandparents, cooked dinner, took care of both kids and finally ate dinner. Here it is 7:30 at night and I am finally trying one of my rolls and it is a little burnt at the bottom and not so great. However, I conquered the recipe and I know what I did wrong. 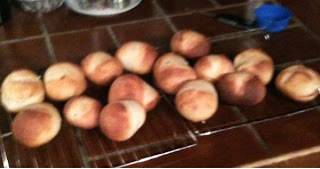 I tried to make Julia Child's version of French Bread Rolls. I will stick to the ATK version of baking. Tomorrow is another day and maybe I will try a fish recipe from Julia Child's The Way to Cook. Never cooked it before, but hey, I am on a roll and if I don't try, how can I learn?